Ah, good on The Asylum. 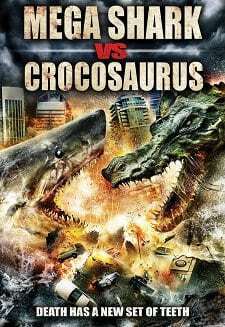 They keep churning out their ridiculous monster movie mash-ups (Mega-Piranha, Mega Python vs Gateroid) and now comes the sequel to Mega Shark vs Giant Octopus (a sequel everyone was desperate for I’m sure) with, well, Mega Shark vs Crocosaurus. While Mega Shark vs Giant Octopus didn’t live up to its awesome title and possible cult status (is was just too damn boring for a film with that title and featured very little shark vs octopus action) Mega Shark vs Crocosaurus is much more fun and at least features the two improbable sized creatures causing much mayhem. 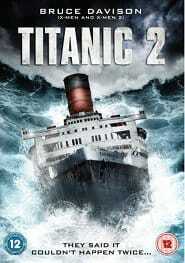 So, what is Mega Shark vs Crocosaurus about? Well, there is a Mega Shark and there is also a Crocosaurus (an insanely large crocodile) and they both cause lots of damage and bother to various US cities and it’s up to rugged Crocodile Dundee type Gary Stretch (he of critically acclaimed films such as Dead Man’s Shoes), military/scientific boffin type Jaleel White (Urkel from 90’s US sitcom Family Matters) and an extremely serious and lover of fine cigars military type Robert Picardo (Star Trek: Voyager and Joe Dante regular) to stop the rampaging beasts. Let the incredibly crappy CGI carnage commence. And boy does it as the two ridiculously giant creatures swallow submarines whole, jump over aircraft carriers in a single bound, cause tidal waves and finally, after a good chunk of the running time is taken up with the main characters stuck in a helicopter stating the bloody obvious (ugh! ), throw-down in an almighty smackdown. 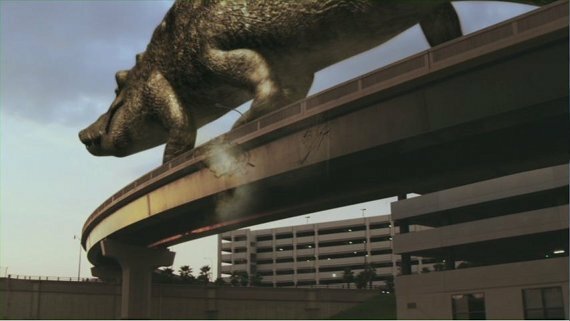 So yeah, the flick delivers all the B-movie goodness and despite the inevitable dull moments of characters banging on and on about this and that in order to pad out the running time and fill in the spots when the special effects budget ran out, Mega Shark vs Crocosaurus still manages to deliver plenty of colossal creature on creature action. Director Christopher Ray (son of B-move directing legend, Fred Olen Ray) knows how to keep a monster movie fun and the cast at least seem game for a laugh with all the ludicrousness thrown at the screen. The CGI is just as crappy as you would expect from a movie with this title produced by The Asylum (and that’s all part of the fun) and if you need an online reviewer (or a serious critic for that matter) to point out that this is strictly a “beer and pizza” movie then you have no right watching a film called Mega Shark vs Crocosaurus. So, if you ever wanted to see a flick with the bad guy from Dead Man’s Shoes, the high-pitched voiced nerd from Family Matters, the hologram doctor from Star Trek: Voyager, a mega shark and a giant crocodile, well, here it is. The flick is released on DVD 18th July from Metrodome. The picture and sound quality are of a fine standard and the disc comes with an obligatory making of and a hilarious blooper reel showing the cast and crew having a hoot making such a silly film. So … no Academy nominations on the cards then? Your jaw might just drop.